This simple, hot, and tangy curry is delicious. For me, it brings back happy memories of childhood family holidays to Goa. We would often eat this curry at roadside stalls or beach shacks. It is so easy to make and tastes great with plain boiled rice. Goan sausage or Goan chorizo reflects the mix of Indian and Portuguese cuisine from Goa, Daman, and Diu, which once were part of the Portuguese State of India. This sausage is made with pork, vinegar, garlic, hot chili peppers, and spices like turmeric, cumin, ginger, cinnamon, which makes it extremely spicy. Some believe that the Portuguese chose to land in Goa because the locals there ate pork, as opposed to the Kerala coast where the largely Muslim population shunned it. The Portuguese sailed with barrels full of pork, garlic, and vinegar. The vinegar slowed the rate of spoilage of the meat and the garlic was full of nutrients. So, while other navies ran out of food or were felled by disease, the Portuguese made it around the Cape of Good Hope and arrived in Cochin and Goa. Pour the cooking oil into a wok or deep, heavy-bottomed cooking pot. Heat on medium heat until the oil is hot. Add the potato cubes and fry, stirring often, until golden. Remove with a slotted spoon and put aside on paper towels to drain. In the same wok or pot, add the sliced onions and fry until translucent. Stir often. Add the tomatoes and green chilies and fry until the tomatoes are pulpy. Add the hot water, salt to taste, and stir well. Bring water to a boil. Add the sausage meat and the fried potatoes. Stir well. Cover and cook on low heat for 20 minutes. Turn off heat and serve the curry with piping hot, plain boiled rice. Goan sausage is usually served on a piece of pao, which is the word "bread" in Portuguese and sold by street vendors. Also, Goan sausage is prepared into a pulao or rice dish. 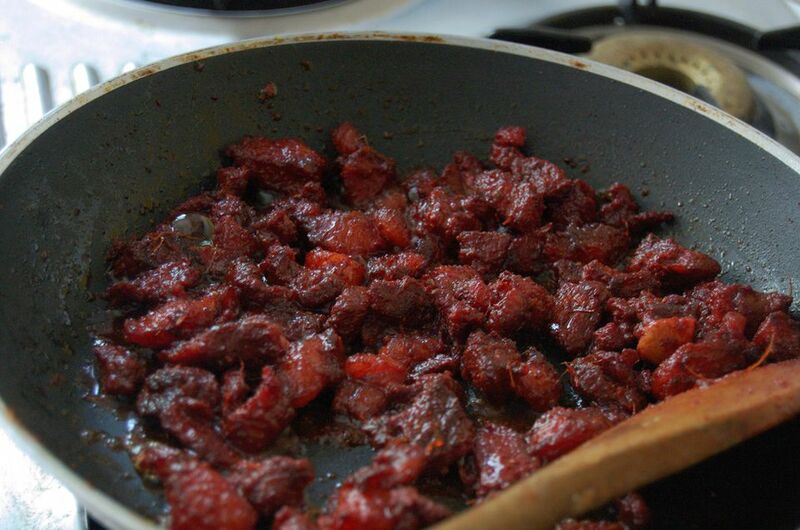 The local Goan version of chorizo is sometimes likened to a solid, stubby cousin of another popular Indian dish, vindaloo since the vindaloo meat is made similarly with a lot of vinegar, garlic, and spices. Goan sausages can be purchased in Indian markets or purchased online. It is also called Goan "chourico" or "choris" sausage and can be sold with or without the casings, fresh, sun-dried, or smoked with special woods chips that impart a richer flavor.